A Seussitastical Celebration—Save the Date! Two of my grandkids have Valentine’s birthdays; we’re getting ready in Eugene for an old-fashioned at-home toddleriffic four-years-old party. But there is a really big, Seussitastical birthday celebration coming up and we need to start getting ready for that, too! March 2, the National Education Association’s annual Read Across America Day, honors Dr. Seuss each year on his birthday. I love classic Dr. Seuss books! Each one is filled with colorful, creative, magical, really cool characters. The fabulous illustrations are exciting for children and stimulate interesting conversation and writing. Reading Dr. Seuss to children always leaves me smiling. I’m planning to read a Seuss book a day until March 2. Let’s read together! Did you know Theodor Geisel (Dr. Seuss) wrote forty-six books? I know about half of the titles really well after teaching many children and reading to our kids. Let’s start reading right now—old favorites and titles we somehow missed! What are your favorites? I’d love to hear from you! Thank you, Dr. Seuss for making us smile, fingers snapping and toes tapping to your magical, lyrical beat! Rhyme, rhythm and predictable patterns make sense to new readers. Playful speech patterns, tongue twisters and innovative language inventions make reading a grand adventure. Simple poetry, a lyrical treat, makes reading to a beat fun! Get out those rhythm instruments and start moving! Dr. Seuss books are perfect for readers of all ages. They are great for kids with special needs, English language learners, and struggling readers. I’ve never met anyone of any age who didn’t like these adventurous stories and unique worlds. In December, my granddaughter Morgan and I read How the Grinch Stole Christmas. January featured Dr. Seuss’ ABC. 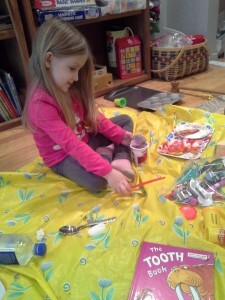 This month, The Tooth Book is sheer delight, along with her newest spin brush and first dentist visit. Beyond life in Eugene, the featured Read Across America title is Oh, the Places You’ll Go, a perfect choice for motivating our children to aspire to greatness in life. I’ve often picked up this book to re-inspire myself. I LOVE THESE BOOKS. Wear your Seuss hat and fill your party bag with teaching tips! Bartholomew and the Oobleck: Seasons, weather, sequence, science experiment. I Can Read with My Eyes Shut: Colors, syllables, spelling (Mississippi), contractions, rhyming. The Cat In The Hat: Word families: ay; at; out; ake; an; ot; also rhyme and repetition. Dr. Seuss’ ABC: Sounds, alphabet upper and lower case letters, rhyming, colors, predictable patterns. The Tooth Book: Perfect for your little one losing teeth! Rhyming, wonderful pictures, etc. 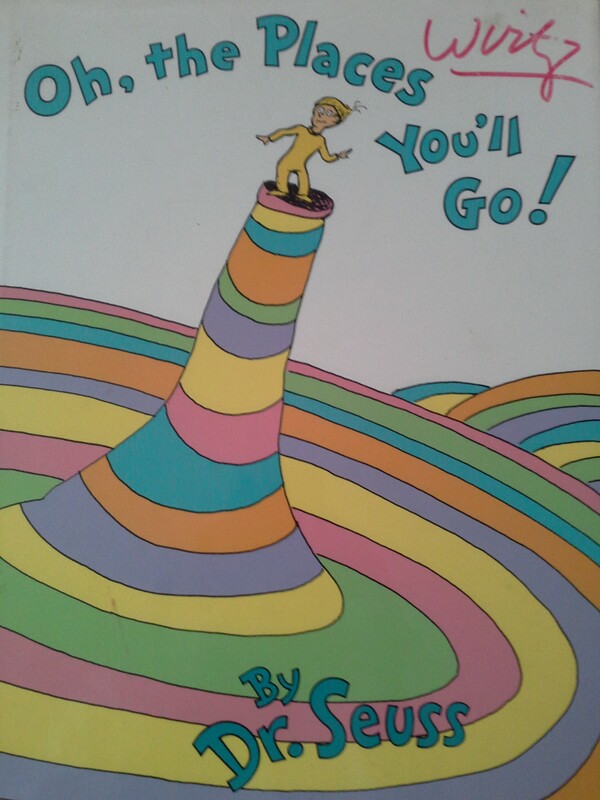 Hop On Pop: Simplest Dr. Seuss, few words on each page, rhyming, word families: ed, all, op, ing, up, own, ee, ad, ed, at, ing. It also also teaches mother, father, sister and brother. A great title for the newest Seuss fans! Oh Say Can You Say? : For more advanced Seuss kids. Rhyming and hilarious tongue twisters. One Fish, Two Fish, Red Fish, Blue Fish: Opposites, direction, counting, rhyming, word families. Green Eggs and Ham: Rhyme, rhythm, repetition, predictable patterns, word families. Fox in Socks: Tongue twisters, rhyming, contractions, word families, punctuation. Ten Apples on Top: A simply great counting book, Seuss style. Of most importance, savor the words and flavorful, tip-of-your-tongue language. 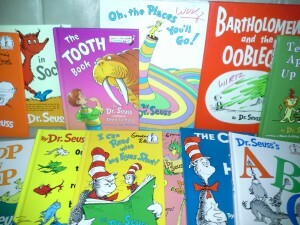 Sharing Dr. Seuss is a special family reading time tradition I strongly encourage. Finally, check out a very inspiring article on literacy and Read Across America in the March edition of Reader’s Digest. The beautiful “The Book I Will Never Forget” may be life changing. Oh, the Places You’ll Go!